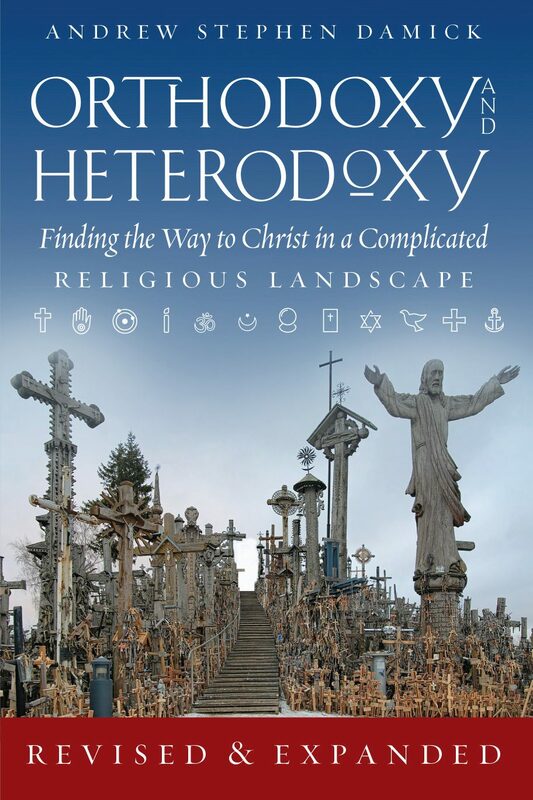 I recently received an email from a Protestant who read Orthodoxy and Heterodoxy and was puzzled by some passages that were seen as being inherently contradictory. I am convinced that my life as a Christian before I discovered Orthodoxy was both real and fruitful. I had been in a period of some drifting from active church membership. I still believed in Jesus Christ and trusted Him for my salvation. My correspondent wrote that this would seem to affirm the idea that an Orthodox convert can look on his religious past and see value in it. I think you are probably reading these statements through a kind of binary in-or-out lens which is common in certain sectors of Protestantism (including the one in which I was generally raised, though I suspect that my family’s theology may well have changed in the meantime — I haven’t really asked, though). In that model, Christian, saved and in the Church are basically all terms referring to the same one thing, and coupled with a “once saved, always saved” soteriological outlook, it’s hard to imagine how one might see things differently. Thus, if the Orthodox claim to be the one Church, then they must be saying that no one else is a Christian, no one else can be saved, etc. Well, that’s not actually the Orthodox view of those things. I’ll try to explain, and please note that I am not offering an apologetic here against any other view but simply trying to explain the Orthodox view (even though I will do some contrasting). First, it’s worth noting how the Orthodox understand how salvation proceeds with regard to time. There is of course a sense in which salvation can be put in the past tense, i.e., “I am saved,” because Christ’s redemption of human nature on the cross is a done deal. And there is also the sense in which I have “put on Christ” in baptism (Gal. 3:27), which does indeed save (1 Pet. 3:21). But for the Orthodox, salvation is also in the present tense (“I am being saved,” cf. 1 Cor. 1:18, 2 Cor. 2:15, Phil. 2:12-13, etc. ); it is an ongoing process. And there is also a sense in which salvation is something that is not yet complete (“I will be saved,” cf. Matt. 10:22, Rom. 8:23-25, Rom. 11:22, etc. — lots more here). But let’s go deeper. What does it actually mean to be saved? For us, it is about putting on Christ, about becoming more like Christ, about being adopted sons and daughters of God, about being in communion with God in Christ, about becoming “partakers of the divine nature” (2 Pet. 1:4). These are all dynamic ways of speaking of salvation, and thus a dynamic temporal approach makes more sense. It is, to put it in Evangelical terms, a relationship, and relationships, while they can have their binary side (I am either married or not married to my wife), aren’t strictly definable by such binary understanding. Indeed, I could get married, have the wedding, wear the ring, and yet not really have a marriage. Which is the greater reality — the wedding and the ring or the actual life together? And to complicate things, I knew my wife before we got married and was working on my relationship with her then, too. And after we got married, there is ebb and flow. And of course we could get divorced (God forbid!). I look with gratitude on all that we already have, all that we now are doing, and all that may yet come. It is about communion, and that is a dynamic reality, not a static, binary one. And because of this soteriological dynamism, all this means that someone could have a genuine relationship with Christ but then step outside it, just as people might have a truly good marriage but still end up divorced. That means that even if someone has been baptized into Christ, he could actually put off Christ, apostatize. There are of course warnings about this in the Bible, such as 2 Peter 2:20-21. This is a very far cry from the mere “If you died tonight, do you know where you would spend eternity?” That is of course an important question, but it is a highly reduced version of what salvation means for the Orthodox, for historic Christianity, and (I would say) in the Bible, too. I mean, in John 10:34, Jesus quotes Psalm 82:6: “I have said, you are gods, and all of you are children of the Most High.” This is a much bigger picture than just whether you get to go to heaven when you die. And how can an Orthodox Christian see someone who is not Orthodox as a Christian? Since we don’t regard Christian as meaning that someone is definitely among the saved, it really has more to do with its historical meaning of adhering to certain core dogmas — the Incarnation (Jesus Christ, the Son of God, is fully God and fully man by nature, one person) and the Trinity (God is three Persons in one essence — Father, Son and Holy Spirit). If someone holds to these things, I consider him a Christian. That does not mean that I think he is heaven-bound, that he is progressing in communion with God, or even that he is in the Church. That said, I don’t see anything wrong with using Christian to mean those who hold to the core Orthodox dogmas of Christology and Triadology, even if such people are heterodox in other respects. It came to be normal to use the word that way especially as schism multiplied after the 11th c. when Rome broke away and then gave birth to the multiplicity of Protestantism five centuries later. So what does it mean, then, that the Orthodox consider the Orthodox Church the one Church? It is a historical affirmation (no credit to us!) of the reality of a continuous historic community from the time of the Apostles. And with that affirmation comes the sad acknowledgement that those who, over time, broke away from that community to pursue other doctrines and other religious practices do not retain the identity of being the Church. There is no warrant in the New Testament for beginning a new denomination based on your new reading of the Bible (or new revelation from God) and that denomination being regarded as legitimately the Church. Historically, schism was often seen as even worse than heresy, because it is a sin against love. That does not mean that we blame those who inherited schisms from centuries before, but we also can’t regard their churches as the Church. There is a difference between discerning whether a particular religious group is actually the Church and judging the eternal salvation of some person who belongs to that group (or to no group at all). In a sense, the key is really found in the one sentence of mine you quoted: “We affirm that there is no salvation outside the Church, but ultimately whether one is in the Church is a question deferred to the end of time.” So one could be outside the Church in this life and yet inside it in the next, brought into it by means known to God but outside of the normal means He gave to us (baptism into the historic community of the Church). But one could also be inside the Church in this life and yet outside it in the next, because of having put off Christ through one’s own choices. We won’t know until the end of time, which is why it is important to be faithful in the meantime and why it is also possible for an Orthodox Christian to affirm what is good that is outside the boundaries of the Church and yet also want those outside those boundaries to come into them if possible. If you want to hear a working-out of what this last affirmation looks like, I recommend checking out The Areopagus Podcast, in which I (along with guests) have conversations on life, pastoral work, theology, etc., with a Protestant pastor who is pretty much my best friend locally. As a convert I relate to your article. I, too, look back at my Evangelical Protestant past as good. I was, in later life, just as dedicated to pursuing personal holiness and worked continually to be more like Christ. I see my conversion as the moment when I stepped into the fullness of the Faith and now had all the tools to continue to work out my salvation in fear and trembling. I knew I was a Christian before conversion because I held to the important doctrines and I loved Christ always attempting to grow more like Him. I see myself now as better equipped for the task, but I also realize that conversion is a two edged sword. Now that I have all the tools I no longer have even the shadow of an excuse for not doing the works of repentance. As a Protestant, I may have gotten some mercy from the Lord because I was never told about many of the things that are needful. I also grew, as a Protestant to very wary of the general tone of what they considered salvation and being saved. When I learned Greek in my Protestant Seminary, I began to see that the verb for “save” did not carry the same meaning that was applied to it in Evangelical circles. In the Old Testament I was taught that the definition was simply to save one’s life in the physical sense in the same way if you pulled me out of deep water that you saved me from drowning. In the New Testament I was taught the verb was used to indicate preserving one’s spiritual/ eternal life. The sticking point comes that all will be resurrected to eternal life but some to an eternal life of condemnation. My theology professor skipped over that inconvenient fact but I saw it as a contradiction to our soteriology. In Orthodoxy, that contradiction evaporates exactly as you outlined. It reminds me of a time a few years ago when I was doing nursing home ministry visiting the poorer nursing homes to spend time with the residents who often are dumped and forgotten by their families. One sweet old man, who had had a terrible stroke came up to me and asked me a very pointed question. He asked: “Mr Preacher, when I die, will I go to heaven?” It would be easy in the soteriology of my Evangelical past to reassure him and tell him by all means because I knew he was baptized and had prayed a Sinner’s Prayer. But, I knew better now and could not do that. What I did tell him is that none of us ever knows for certain because we do not have a seat in the heavenly jury box or are any of us on God’s Advisory Board. I then said I could tell him one fact that he could hang all his hopes on. I told him that he could rest assured that whatever decision the Lord makes about us on that Great and Terrible day, that it will be the perfect decision. I then asked him if he could live with that and he smiled as best he could (stroke damage) and said, Yes Sir that I can believe in. Thank you for this post Father. I look forward to the discussion that follows. Thank you Fr. Andrew. Your explanations, particularly your reference to the 4th C. canons as well as the current accepted definition of a Christian, were were very helpful. I am an Orthodox Christian hospital chaplain. Our new software demands that I check a box designating a religion for my patient . I have been confronted with the dilemma of having to put a non-baptized person who is seeking Christ in the only appropriate box–“no religion”. This is disconcerting as this means that they are thrown in with atheists and skeptics!! i am sad that, as they are just stepping on the path ,I cannot mark them as Christian. My software clearly needs more nuance but I doubt the hospital IT department would understand.. It is unfortunate that the different Orthodox bishops can not agree on the wording for the others that you refer to as churches. I am not disagreeing with any of your writing, but there is not even near consensus on how to address the other churches when speaking about them, dare say much else. Do they need to agree? The wording is not so important as the general approach, which is much the same, certainly in terms of the actual theology and roughly in terms of practice. And even the variation is itself consistent with the history of the matter — it has never been uniform. I don’t see why it needs to be. That said, this isn’t really what this post is about. The question is rather how a convert can look upon his own religious past and also how he treats the non-Orthodox. I replied that I would wake up at the Last Judgement and where I went after that was not up to me! I have often wondered if that was the right reply? I am puzzled by what appear to be repeated implications in your book “Orthodoxy and Heterodoxy” and in the post above, that if someone is a Trinitarian and Dual Nature-ist (ouch! ) that is enough to be deemed a “Christian”? Saying “Orthodox would agree with this or that” term or position, when it means something decidedly different to Orthodox vs. non-. One can’t take words at face value: similar terminology as meaning the same things to Orthodox and to “heterodox”. Our Orthodox Church defines Christian as Orthodox. Saying someone believes in the Trinity or the Dual Nature of Christ is not enough for us to agree with…. Filioque-ists are Trinitarians but heretical ones. Or if someone affirms the dual Natures, but in an Anselmian sense of Vicarious Satisfaction/Substitutionary Atonement — likewise. So perhaps it’s better to leave it at Roman Catholic (assuming they are not lapsed, of course) or Protestant A, B, C, etc, etc……. In other words, what is the point of reassuring “heterodox” (who are really in heresy, knowingly or unknowingly) that they are “Christian”, if by doing so one papers over that their “Christianity” is wrong, is heretical and thus ineffective — non-Grace-bearing? Let me clarify… 50 years ago I left being a lapsed Episcopalian (if that isn’t redundant yet oxymoronic!!) and started on the road of Orthodoxy by being baptized into the ROCOR of St. Philaret of NY’s Sorrowful Epistles. So perhaps I am overly suspicious of “creeping” ecumenism, since the Episcopalians/Anglicans are militant all-is-grey proto-Ecumaniacs. While you, coming from the world of black and white “saved” or “not saved” — predestined — Protestantism, are perhaps less tetchy about vagueness. And perhaps I am doing you an injustice. Speaking as a retired Protestant Sr. Pastor, I couldn’t agree more, only it took me many years of studying the theology of another Protestant, Thomas F. Torrance, d. 2007, (an Athanasian), to understand and embrace this Reality in depth. Are you familiar with the work of Torrance? What if someone (who had a living and active faith in Christ) converted from a Protestant denomination to Orthodoxy, and they did reject their religious past, because that was what they were led to believe by some Orthodox? What are the dangers of that? Does it fall under blasphemy against the Holy Spirit? What would it take for that person to find forgiveness? I don’t believe anyone will be cast into hell on a technicality.